Identify a nonprofit organization that can help you. Find out who in your community provides free legal support services (eg, immigration advocates, legal aid organizations, churches or workers centers). Identify an attorney. Find out name and phone number of a reliable immigration attorney ahead of time and keep this information with you at all times. Obtain a “know your rights” card. These cards state that you would like to exercise your right to remain silent and that you would like to speak with an attorney. The name and phone number of your attorney should be listed in the card. 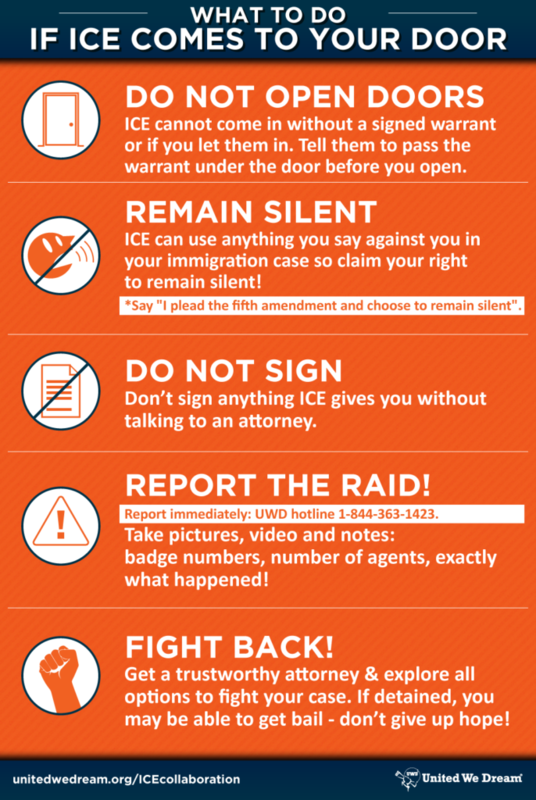 Advise family members who do not want to be questioned by ICE to stay away from where the raid occurred and where the detained person is being being held.